Fife is a golfer’s paradise. Numerous world famous championship courses dot its coastline a short drive from Elie Cottage. 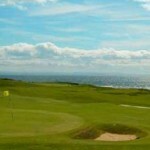 Fife holiday cottages are the perfect place to plan your conquering of these great golf tracks. The British Open returns to the Old Course at nearby St Andrews this year (July 15-18). Only a 15 minute drive away, a self catering fife holiday at Elie Cottage would be a great base to catch all the action. Available for the whole period, either as a 10 day or 7 day let. Fife is a golfer’s paradise. Numerous world famous championship courses dot its coastline a short drive from Elie Cottage. Self catering at Elie Cottage is the perfect way to plan your conquering of these great golf tracks.